Acromegaly is a medical condition that results from an excessive production of Human Growth Hormone (HGH) in the body. The term is derived from the two Greek words ‘akros’ and ‘megalos’. The former means ‘extremities’ while the latter means ‘enlargement’. Putting them together, ‘acromegaly’ means the abnormal enlargement of one’s physical stature. Acromegaly is more often referred to medically as pituitary adenoma. It is also the most common pituitary gland disorder. What causes the pituitary gland to produce too much amount of growth hormone is the presence of benign tumors on the gland. The pituitary gland is the organ responsible for the secretion of the growth hormone. A poorly-functioning pituitary gland can cause either an undersecretion or oversecretion (which is thee case in acromegaly) of the growth hormone. Though the onset of symptoms might begin at any age, people in their twenties are the ones mostly affected by acromegaly. This condition should not be given immediate treatment since it could lead to several life-threatening adversities. One positive thing, however, is that acromegaly is a highly-treatable condition. But it is important to notice the symptoms and diagnose it as soon as the onset begins. The problem is it that catching it early is a very hard thing to do. Worse, acromegaly might be accompanied by other underlying disorders. Acromegaly can also be attributed to tumor growth outside of the pituitary gland though it very seldom happens. Another factor that could contribute to growth hormone overproduction is the presence of bumps on some areas of the brain, in the lungs, and in the pancreas. The said tumors have the ability to both automatically produce growth hormones and stimulate the pituitary to produce a huge amount of growth hormone. Gigantism, another medical condition involving abnormal growth rate, is usually linked with Acromegaly. But keep in mind that the onset of gigantism usually takes place as early as childhood. These unsuspecting children develop tumors way before the fusion of growth plates. As a result, a very fast increase in height will take place - something not possible during a person’s early twenties. During its onset, the symptoms of acromegaly appear to be either mild or non-existent. This is why it remains undiagnosed for several years. 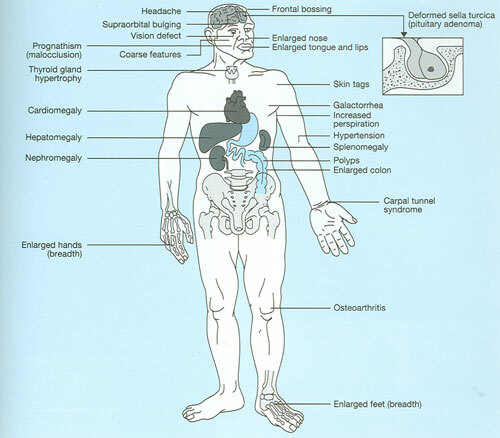 Only when the body starts to become distorted or disfigured will the presence acromegaly become seriously considered. All of the above manifestations can very easily be dismissed as normal features or physical appearance. But once they are accompanied by joint pain, deepening of the voice, easy fatigability, decreased sexual desire, chronic headaches, sleep apnea, oily skin, and impaired vision, it becomes a totally different story since all of those are definitive characteristics of acromegaly. If there is continuous growth hormone overproduction, it can easily become a serious threat to the person’s health since serious damage to the major organs of the body can also happen. For instance, the presence of cardiomegaly (the enlargement of the heart) can be the most hazardous situation since the risk for cardiovascular diseases and high blood pressure are both increased. Colon cancer, diabetes and pituitary adenoma could also take place during acromegaly. There might be times that those who develop tumors will not be able to experience pituitary gland abnormalities. The rate of acromegaly’s occurrence is 4 in a million, statistically making it a very rare condition. But that statistic could be a bit misleading since there still are several undetected and undiagnosed cases of acromegaly. This is done to carefully measure the level of growth hormone present in the bloodstream. However, this test could be inaccurate at times since the secretion of growth hormone occurs in spurts. This means that a normal result for blood growth hormone levels is not automatically mean the absence of acromegaly. For accuracy assurance, a procedure called the Oral Glucose Tolerance Test (OGTT) is performed first. This is when an oral glucose solution will be administered to the patient prior to performing the blood test. A normal OGTT would cause the amount of glucose given (about 75 to 100 grams) to reduce the blood growth hormone level. On the other hand, an OGTT on people with acromegaly will have no effect on the level of growth hormone in the blood. MRI is indicated to detect the exact location and size of the cancerous growth in the pituitary gland. This is in order to find out the exact cause of the growth hormone overproduction. But not all people are fit to undergo the MRI since it involves the usage of a very powerful magnetic field. People with implanted metals in the body such as a pacemaker and bone screws are notable examples of contraindications. So instead, a CT Scan will be performed on them to perform the exact same function the MRI is supposed to do. If tumors cannot be found in the pituitary gland, doctors will usually resort to widening the tumor search. Areas like the pelvis, the abdomen, the chest, and the brain are all explored. The tumors causing growth hormone overproduction are all removed. This is by far the most effective and the most fast acting of all the treatment options. Somatostatin Analogs (SSAs) are often prescribed to help in tumor reduction pre-operatively. This is also the treatment method next in line if ever surgery does not work as initially expected. The third treatment option in line in the event the surgery will not work and the patient becomes resistant to any pharmacologic measures done. Radiation therapy contains the most side effects since it also kills normal cells along with the target tumors. The effectiveness of treatment modalities will vary from patient to patient. This is why not all patients will respond to the treatment as well as the others.